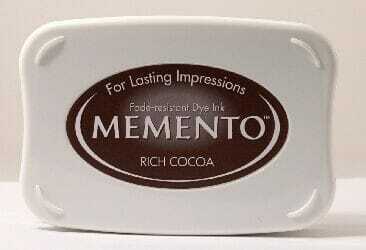 Rich Cocoa Memento dye Ink Pad for Stamps is fast drying and fade resistant. The innovative pad delivers finer impressions and exceptionally even coverage. To create a lasting memento giving exceptional coverage and very fine impressions, use the Memento Fast Drying Dye Ink Pads which are available in a large variety of colours. Customer evaluation for "Tsukineko - Rich Cocoa Memento Ink Pad"